Further, when asked by the Wire Report about two meetings last October reported by Bell in the lobbyist registry with Scott Hutton, the CRTC’s Executive Director of Broadcasting (and Acting Secretary General last fall), the CRTC responded that there was only one meeting and that it did not involve FairPlay. Second, the two October meetings were not the only Hutton meetings with Bell. Documents reveal that Hutton also met with Bell on September 21st, immediately after the meeting with CRTC legal staff. 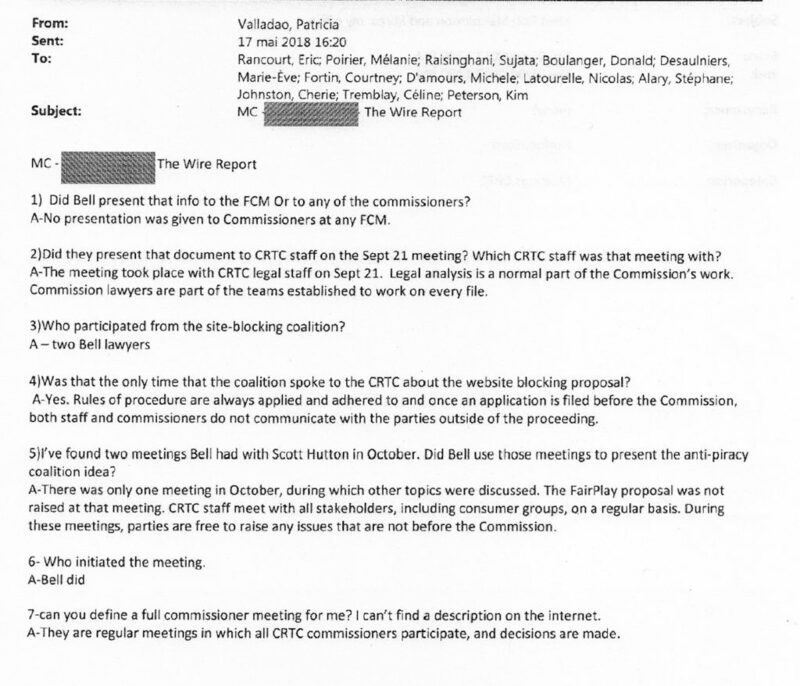 In other words, according to the CRTC and now-public records, Bell executive Rob Malcolmson asked a CRTC commissioner for a meeting on site blocking in July, raised site blocking before a House of Commons committee on September 20th, delivered a full powerpoint presentation to CRTC staff on site blocking on September 21st, and then walked down the hall to meet with the CRTC’s Executive Director of Broadcasting but did not bother to mention the issue. Irrespective of the credibility of the CRTC’s rendition of what occurred, the documents again highlight the risks associated with backroom, secret meetings on policy proposals, which the Commission itself admits may not need to be publicly disclosed. Reforms to the access-to-information system to ensure those meetings with senior Commission officials are captured under the law are long overdue. Niggle: I know “fullsome” is something of a standing joke to describe meetings in government, but in this case “the CRTC’s response to reporter questions was far less fulsome” sounds like they were refraining from verbosity instead of being stingy with the facts. Since Menzies left the CRTC, there has been no action whatsoever on building competition. All the things accomplished to try and bring fiber to the home to a competitive market have been sitting and gathering moss for years now. Pricing has changed radically for high speed access, yet independents are still paying something like $12/megabit for transit to their customers – while Bell is offering 300Mbps unlimited to their end consumers for $50/mo complete. The Liberals are showing us that they love big business and they think it’s not corruption as long as there are two or three telcos throughout Canada. This is an abomination. The CRTC staff and Commissioners that met with Bell should resign now that it has been revealed that they misled, if not outright lied, about meetings with Bell. If rules regarding lobbying have penalties for sidestepping if not violating the regulations, Bell should be fined and prohibited from having any contact with the CRTC for some period of time.